what, me blog? : Papertrey Ink January Blog Hop! "Pick your favorite project from 2011 and share it with all of us! To take it a step further, you are also challenged to create a second card that is inspired bythe favorite project you select." Here you can see each of the 4 card fronts. I used Harvest Berries on the upper part and Text Style 2 under the Quatrafoil die cut. I varied the sentiment panel (Mat Stack 1 and Mat Stack 4) and also the finishing treatment of ribbon & bow or twine & button. The sentiments are from Little Labels. I decided as long as I was going all out, why not stamp the envelopes to coordinate also? Last of all, a long time ago I ordered PTI's Clearlly Creative Card Boxes, and had not even opened the package! Since I had such a complete set, I figured I would decorate a box for it too. I used my brand new (just arrived yesterday) Mat Stack 5 Collection and Oval Limitless Layers dies! I added the simple band to the box and stamped it with Harvest Berries, as well as the white oval. *swooning* love your card in all its different colors. Be thrilled to get & be able to give these cards. Wow!!! Love the Christmas card and I love this beautiful set of gorgeous cards you made, the stamped envelope is just the perfect touch . Amazing Debbie. Your new card set and envelopes are just incredible. Love the design you set up and the box to give the gift away is perfect. Yu are one busy stampng lady. Love the card. Harvest Berries is one of my favorite. I love it paired with the quatrefoil. The colors you chose are awesome. The kraft one looks great. Awesome jobwith the gift packaging. 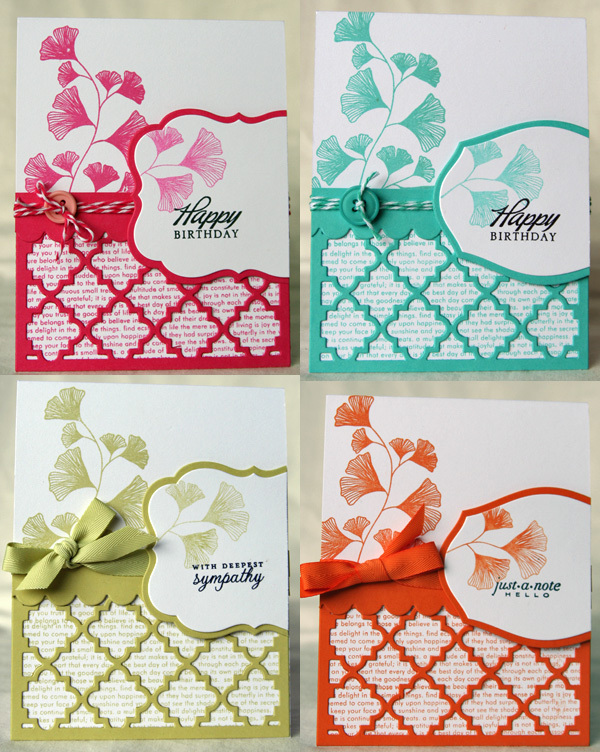 LOVE your new variations on an already fabulous card! So beautiful! I love your new take on the original layout...the colors are so great! Wonderful card set. Someone is going to be so very happy. I like how you varied certain elements and kept others the same. It makes for a great set. And, decorated envelopes are always so fun in a card set. I just made a set and haven't packaged it. I may just CASE your box decor. WOW -- what FABULOUS re-makes of a FABULOUS Christmas card and ones I'd be thrilled to receive. My home address is . . . ! Ha-Ha! I am totally inspired now to create some card sets for gifts -- TFS!!! *Sigh* These are breathtakingly gorgeous Debbie. Love everything about them. Great idea to add the text stamping under the quatrefoil. Debbie, you've really 'hit it out of the park' today. I love all the different techniques you've incorporated on these cards. Just a stunning and colourful set!! Beautiful! I love the set and I love how you packaged it up too!! Gorgeous set!! I'm definitely casing this some day. LOVE your bright, cheerful set of cards...they look amazing all lined up against each other...love how you used the die at the bottom. TF inspiring! Beautiful cards! Love the lace overlay! Oh My goodness! These cards are gorgeous! I need to add those stamps and the die to my list. Really gorgeous...btw, did I say "gorgeous"?!! LOL. I am AWESTRUCK. I cant figure out what i like the best! the colors? the quatrefoil? the packaging? the scallops? Such eye candy! Oh, what a pretty card set! The colors you used are so adorable. Lovely! Good grief...whoever receives this gift card set is one seriously lucky person....those cards ROCK!!! I love the bright colors, your unique stamping, and the use of the quatrefoil die...WOW! A very pretty card set. Like your design in making them. Wow..... a beautiful card set incorporating really lovely colors and great technique(s)! Oh wow, these are gorgeous, Deb! Those are SO nice Debbie! I really do need to go check out PTI products. Probably that is dangerous to do, lol. I love this set! The bright colors with the white are so fresh. You've really done a beautiful job. 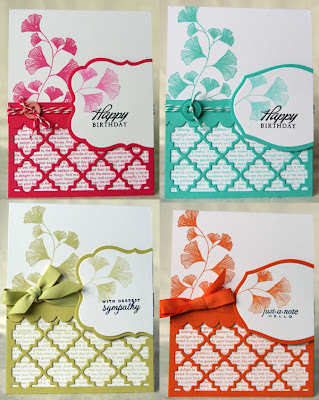 And your use of the Quatrefoil die is making me want to pull mine out and use it tomorrow. Thanks so much for sharing! GORGEOUS card set! what a wonderful gift! your color choices are fabulous...so bright and cheerful. Stunning card set really love it! Girl, these are seriously amazing cards- so beautiful! They are perfect, and I am going to CASE your awesome set! Great card set. Love the bright colors. A beautiful card set- lovin ur packaging too. A gift is always made more special with fab wrapping. Very inspirational - love all of the colors! LOVE LOVE LOVE this set!!!! Thanks for the inspiration!!! I just came across your beautiful cards doing a google images search. They are so pretty and make me want to buy so many supplies! I was wondering if you could please share how you did the sentiment panels. Are the coloured portions stamped borders? It looks like the white part and coloured part are actually different pieces of paper, have you paired up mat stack and mega mat stack dies? Sorry if this is a dumb question, I'm new to die cutting and to papertrey! Actually, is it mat stack and layerz mat stack?! You know I only wanted #4 in the regular size before I saw this post, now I want #1 as well, and in both sizes!! !